Thom Beemer of Northampton, Mass., is marching second bass for the Spartans. It's his third year with the Spartans and his fourth year marching drum corps overall (he marched top bass for Knight Storm in 2000). 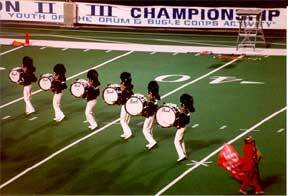 "The picture I am sending you is of the 2002 bass line during the 184 section of our opener. It was taken during our finals performance in Madison, Wis. We were the only six-man bass line in DCI last season. I really like this picture because it caught us right in the middle of one of our runs (our spacing is really good in the picture also). You can see our fourth bass, Chris, about to hit the drum, myself (fifth bass) extended for my notes and our sixth bass, Brenden, starting to come out. Thanks a lot." We're running low on Forzato pics! E-mail your submissions -- and we will get to them all, in time -- to dave@dci.org along with where and when the photo was taken. Send some biographical information about yourself as well. We'll give you full credit. Also, let us know if you want your e-mail address included, to get feedback from other drum corps fans.